Sod Turning Ceremony for the Wicklow Hospice Foundation. The Sod Turning Ceremony for the Wicklow Hospice with the Minister of Health, Simon Harris was held at the Hospice Site, Magheramore, Wicklow on 21st June 2018. This event was a joyful occasion as it marked the end of a nine-year struggle to build a hospice in Wicklow. The 15-bed hospice, which will be staffed by seven palliative care nurses, will be under the umbrella of Harold’s Cross and the Blackrock Hospices. The Wicklow Hospice is due to open next year. A total of €4 million has been raised by the public over the past nine years and the support of Minister Simon Harris, led to a further €1.25 million from the HSE, bringing the funds to €5.25 million allowing the charity to secure a bank loan for the balance. The multi-Oscar winning actor, Daniel Day-Lewis, was present as he is one of the foundation’s patrons and great benefactor. Also, all the marathon runners who raised money for the Hospice over the years were proudly present, as well as all the people who have helped in various hidden ways. 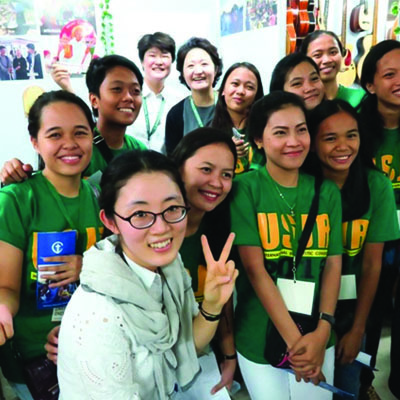 Picture of Mr. Simon Harris, Minister for Health, with Columban Sisters who have been missioned in Myanmar, Peru, Chile, Hong Kong, Ireland (Harold’s Cross), Korea and Pakistan, together with joyful fundraisers enjoying the moment. Many Columban Sisters were present because the Congregation of the Missionary Sisters of St. Columban graciously donated the land. 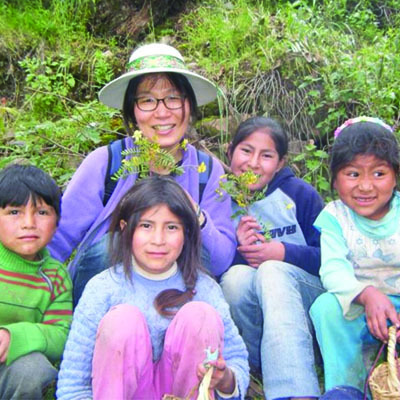 Over this nine-year span three administrations of the Columban Sisters have been involved in negotiations, ranging from Sr. Anne Ryan, Sr. Ann Gray and now our present Congregational Leader, Sr. Susanna Choi, who had the privilege of turning the first sod. 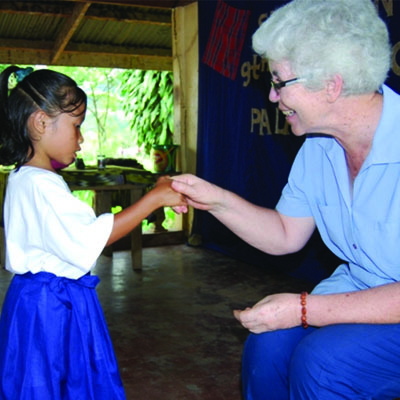 Sr. Susanna was missioned in Myanmar prior to becoming our Leader. We owe a debt of gratitude to Srs. Mary Mortell and Mary McGuinness, our Congregational Bursars during all this time of negotiations and who during all this time ensured that all necessary legalities were upheld with the transfer of the land. 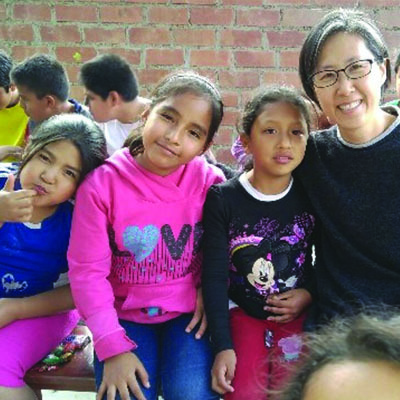 This ministry of Hospice Care is very close to the hearts of the Sisters who have worked untiringly in this field in their mission countries throughout the world. 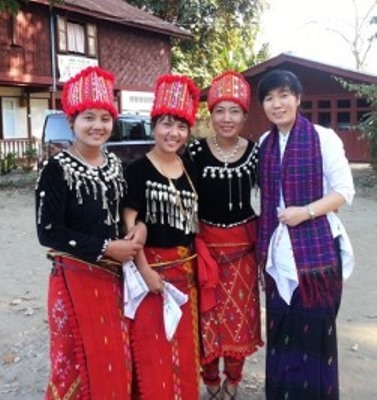 During the past years Sr. Mary Dillon founded, built and has just handed over our Home of Hope the local administration in Myanmar (picture below) and she recalls: “Hospice care for the dying is very central to the ministry of the Home of Hope; we do have many people left in our care, rejected by family and community. We at the Home become their family, we take care of their needs, we sit with them and hold their hand when they finally close their eyes in death and we take care of their burial; their final resting place. It is a Home where people who are homeless can come and where those who are discriminated against are welcomed. It provides a home in which people of different religious beliefs and different ethnic background learn to live together and help each other”. Background History of the Wicklow Hospice by Sr. Ita McElwain. Sr. Ita has a long history of working in Palliative Care since the 1970’s where she worked in St. Joseph’s Hospice, London with the Guru of Palliative Care: Dr. Cecily Saunders and Dr. Therese Vanier, a sister to Jean Vanier, founder of the L’Arche communities. Ita wrote: “Miriam McGrath is a palliative care nurse who was involved in home care palliative care in Wicklow. She and others were acutely aware of the great need for a residential care hospice to serve the needs of the South Wicklow, North Wexford and East Wicklow people suffering from long and short term cancer and other terminal illnesses. The group was formed in 2008 and decided to take definite steps to establish a hospice where ill people could be treated on an inpatient basis as well as having day care and home care services. They were asked to find a site and initially their efforts were fruitless. Then one Sunday morning Miriam attended Mass in Magheramore chapel as she was wont to do, along with her husband Tom. She stood at the steps of the Chapel and looked at the lovely fields and landscape area of the Columban Sisters convent with the view of the sea in the distance. She mused wouldn’t this be a beautiful spot for our Hospice? Miriam mentioned her desire to me and as hospice care is very close to my heart, I felt quite enthusiastic about the possibility and I suggested that she write a letter to our Congregational Leadership Team and ask. I said: never venture, never win! Miriam wrote and Sr. Anne Ryan who was the Congregational Leader at the time received this request very gladly. 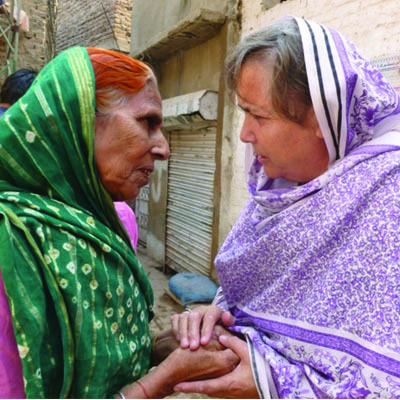 Anne too had personal experience of working in palliative care and as the first step, she wrote to the members of the Congregation who responded positively. As a result, it was decided that the Columban Sisters of Magheramore would donate a portion of land where the Wicklow Hospice would be built. Today 21st June 2018 that dream has become a reality as we gladly gathered with many people to turn the sod on what will be the Wicklow Hospice. Sr. Susanna Choi, our Congregational Leader along with Simon Harris, Minister for Health and Bill Porter, the Fund Raising Coordinator were chosen to turn the sod on this historic moment”. Sod turning ceremony for Magheramore Wicklow Hospice by Sr. Anne Ryan. It has taken nine years to see the first work begin on the Wicklow Hospice site. It was a great day for all those who have longed to see progress on the building of the Hospice. I was really happy to see the fruit of so much work; and could share the joy of those who have worked all these years to make this event become a reality. The saying ‘no pain no gain’ also applies to this great venture. Meeting some of the members of the original Wicklow Hospice Foundation brought me back to 2009 when Miriam first approached us regarding a donation of land. We recalled some of the events of that time and she and others acknowledged the generosity of the Congregation and our whole-hearted support for this venture. There was a large group of supporters, fundraisers, volunteers, staff and people who are part of the Hospice movement. There was representation from media, politics, and medical services also. There is a strong bond and sense of community between those involved in Hospice and cancer support services. 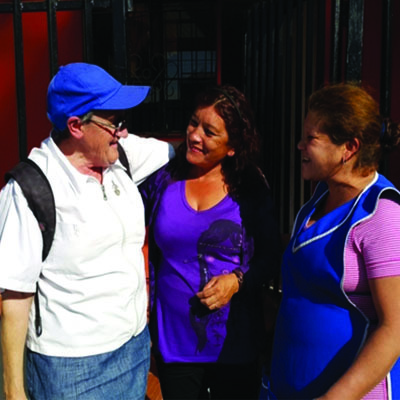 We Columban Sisters have played a significant part in the Hospice movement in many of our ministries across the Congregation, often being pioneers of Hospice care and palliative care in the communities where we are missioned. Health Minister Simon Harris gave us great praise for our generosity in donating the site and remarked that we will leave a great legacy to those who will benefit from the service of the Magheramore Wicklow Hospice. Minister of Health, Mr. Simon Harris thanking Sr. Susanna Choi, Congregational Leader of the Columban Sisters. The Wicklow Hospice Foundation’s Chairperson Sean Dorgan also thanked the Congregation for the donation of land and its significance to the campaign. Danial Day Lewis was in attendance, he gave a very generous donation to the Foundation early on in the campaign which gave it a great impetus. Daniel Day Lewis chatting with Sr. Ita McElwain. We also heard confirmation that Our Lady’s Hospice Harold’s Cross will be taking charge of the management of this new Hospice which Simon Harris hopes to see open its doors in 18 months from now. Many people who attended remarked on the beauty and peacefulness of the site and we wish them all the best as they begin a new chapter in their work of providing Hospice services for the people of Wicklow and the south east.